Atlantis Movers – Moving can be a breeze when you have a team behind you. Discount South Florida Movers has been doing the heavy lifting for people since 2001. Our professionals will eliminate all of the hassle that comes with moving. Whatever your needs are, we can help you. Let us know any special requests you have and we will accommodate you. From packing to long distance shipping to storage solutions, we do it all for your residential and commercial moves. No matter what distance you are moving, call us. For longer moves we can arrange shipping for you. Contact us now for a free quote and see how low are rates are. We guarantee you will be satisfied with your move. Atlantis is a city in Palm Beach County. This small city of 2,000 residents was named after the mythical island and sits on only 1.4 square miles. The lands the city was built on were originally a Brahman cattle ranch. In 1958 developers bought the property and build a country club and residences. The next year the city of Atlantis incorporated. The city is probably most famous for their JFK Medical Center. It was the site of the first reported case in the 2001 anthrax attack. Lately the city has been attempting to woo various baseball teams, including the Atlanta Brace, into opening training facilities in the area. 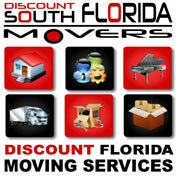 Discount South Florida and Atlantis movers provide low rates on residential, commercial, piano and long distance moving.